Women in sport intrigue me. When pushing your body to it’s limit, how does this make you strong mentally, what lessons do you learn about yourself and how can you apply this knowledge to other challenges in life? For those who don’t k now, Chrissie is three time world champion Ironman. In an interview, Chrissie expressed how women with body issues depress her. Her mission is to inspire others to unlock their hidden sporting talents. “The gender boundaries that exist in other sports don’t exist in triathlon. And I love that.” Chrissie always portrays an image of positivity, smiling, enjoying her job, never complaining. How many people do you know like that? I can think of 2 or 3 and they never fail to make me smile. Surrounding yourself with optimistic people really does have a profound influence on your own well-being. Chrissie has recently become patron of the Jane Tomlinson Appeal, which leads on to my next inspiring woman. 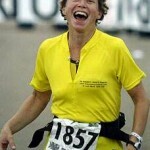 Marathons and triathlons are part of my life, therefore I relate to Jane’s focus on these athletic challenges. I think of Jane whenever on a particularly difficult run or race, each thought of Jane’s strength against such adversity propels my legs further. These are just two women who I aspire to. Many of my friends and family cause me to stop and question a natural instinct to think negatively. I cannot stress enough the important of keeping inspiring figures in mind and surrounding yourself with the kind of person you’d like to be. In my case, this doesn’t necessarily mean world-class athletes, but local triathletes and friends, business people, those who have achieved in life or those working towards success. Watch this video to consider the importance of winning, competition and personal achievement. I recently met Dave Scott at the TCR show in Surrey. Listening to him impart his wisdom on the subject on triathlon inspired me to watch footage of his famous race with Mark Allen in the 1989 Ironman World Championships. You may think, how can this teach me about life? You may not be interested in triathlon or any kind of sport. But there are definite lessons to be learnt from those who push themselves to the limit. As a six time world champion, Dave Scott had to defend his tittle in Hawaii, the Tour de France / World Cup equivalent in triathlon. Mark Allen, his competition ended up taking the title, after a neck and neck race. As you will see on the video, and from meeting Dave live, he shows no bitterness towards his rival, no regrets. Why? He gave his all, did his best. What more can you humanly do. Whatever you aim for, give it your all. How many times can you honestly say you have done this? When did you last put your heart into something to the point where you literally gave blood, sweat and tears? Sounds a cliche, but it’s true. Personal achievement is what matters, over competition. Winning is a state of mind. Only you can decide if you deserve to take the title. To get something you’ve never had, you must do something you have never done.